2 3⁄4" x 2 3⁄4" - 3 3⁄8" x 3 3⁄8".........2 1⁄4"
3 1⁄2" x 3 1⁄2" - 4 3⁄8" x 4 3⁄8".........2 3⁄4"
4 1⁄2" x 4 1⁄2" - 6 1⁄2" x 6 1⁄2".........3 3⁄4"
Reproduction of the rosettes in your home is our specialty. For duplication, send us the block, or a full scale accurate drawing of the profile. When specifying thickness of rosettes, allow for edge profile. Add thickness of casing, size of moulded edge, and 1⁄16" reveal. There is an additional knife grinding charge for custom profile orders. Other sizes and species of rosettes are avialable upon request. 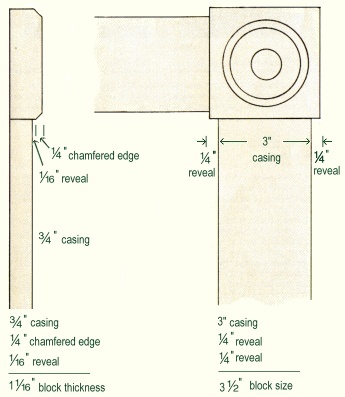 When specifying size of rosettes, allow for casing plus 1⁄4" reveal on each side.